Because the joint can move through so many planes of motion and is used so often throughout the day, it can become worn and inflamed. If you notice any of the above symptoms, you should reach out to your TMJ expert to be fully examined. 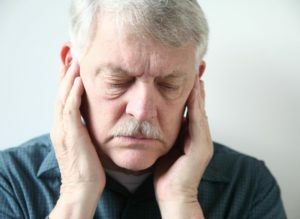 Home exercises – There are several exercises that can be performed at home to aid in restoring your jaw health. Your dentist may have you do such things as partial or full opening of the jaw, chin tucks, side-to-side movement and other exercises that are geared toward strengthening your jaw. Over-the-counter medications – To ease some of the pain sensations you may be experiencing, your dentist may recommend you take an anti-inflammatory medication like ibuprofen to relieve the swelling and lessen the discomfort. Moist heat or cold packs – Another recovery method is to harness the healing aids of cold and hot temperatures. You can start by applying a cold compress to the side of your face for 10 minutes and then a warm towel for roughly five minutes. Eating softer foods – Choosing softer food options like yogurt, mashed potatoes, cottage cheese and smoothies can also help to alleviate some of the pressure to your teeth that contributes to TMJ disorder. Custom nightguard – Patients have experienced tremendous success with the custom nightguard provided by Dr. Cowell, which helps to properly align the jaw while they sleep. It also aids in preventing bruxism (teeth grinding). Having problems with the TMJ can make life uncomfortable, but when you receive expert care from a dentist in Deland, you can soon enjoy improved jaw health. Dr. Christopher J. Cowell earned his dental degree from the University of Florida College of Dentistry. Since then, he has gone on to provide his patients with the absolute best in comprehensive dental care. To aid in delivering top-notch treatment, Dr. Cowell maintains professional memberships in such organizations as the Florida Dental Association and the American College of Dentists. He provides TMJ therapy at his private practice, and he can be reached for more information through his website.